The serpent’s head is a more precise pointer than the curves of the serpent’s body. It points to the place on the western horizon where the sun would set near the summer solstice. I use the term “near” because its alignment is not perfect. The head of the serpent actually points about 1.3° south of the true summer solstice sunset point. The “misalignment” of the serpent’s head relative to the summer solstice sunset. This misalignment has troubled other researchers. The apparent size of the sun in the sky is about 1/2°, so a misalignment of over two solar diameters, would be very noticeable to anyone. Whatever group had the technical sophistication to construct Serpent Mound would have been able to pinpoint the summer solstice sunset to far greater precision. In order to rationalize the apparent error, William Romain makes several adjustments that tend to minimize the discrepancy. He rounds the elevation of the horizon to 1°, which overstates its elevation. The summer solstice sun moves down and to the right as it approaches sunset, so a higher horizon elevation would put the computed point of contact with the horizon farther to the south. This round off affects the numbers on paper, but would have no effect on actual observations, since the direct observations are not rounded off. He increases the horizon elevation even more by taking the horizon level to be at the tops of the trees along the horizon. This, of course, makes assumptions about the density of ground cover in ancient times, which could be variable due to fire, blight, drought, etc. The sun would shine through any but the densest of forests. Not finding these explanations convincing, I took a different approach. 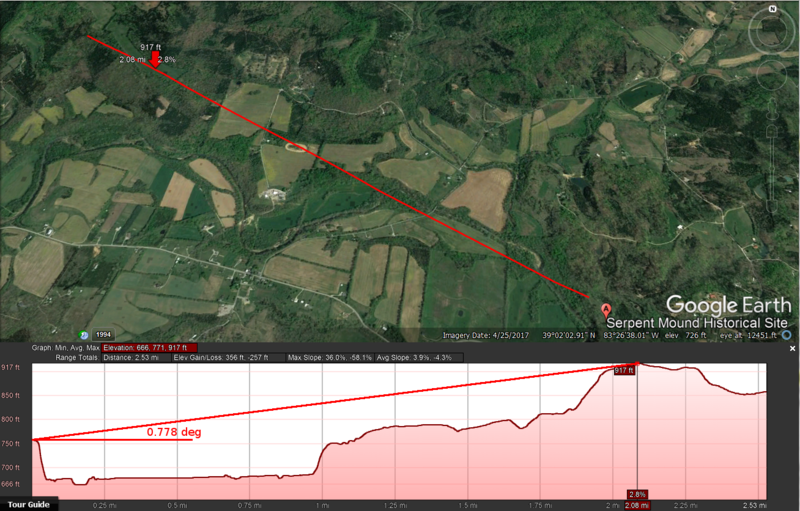 Maybe the serpent head pointer was not actually intended to point to the sunset on the summer solstice. So I asked myself, where, then, does it point? We need to start with good measurements. The first step is to establish the azimuth of the sunset without the “tweaks” introduced by Romain. One factor in this calculation is the angular elevation of the horizon along the line of sight when looking at the setting solstice sun. Google Earth offers a tool for measuring the elevation along a path. Sighting from Serpent Mound to the horizon we can compute that the elevation angle along the line of sight to the summer solstice sunset is 0.778°. Using Google Earth, I was able to determine the angular elevation of the horizon in the direction of the summer solstice sunset: 0.778°, based on a flat earth approximation. The curvature of the earth for 2 miles is 0.029°, so the net elevation of the horizon is 0.749°. With this as input data for the sunset routine in PyEphem, I was able to find the azimuth of sunset over a range of dates near summer solstice. 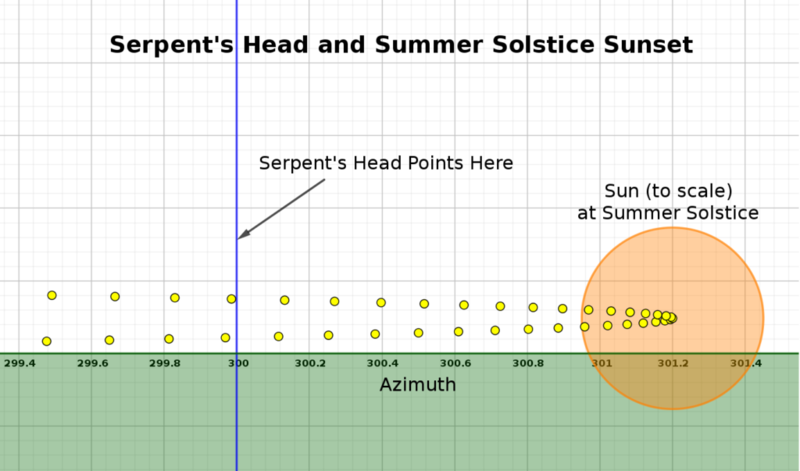 Azimuth of summer solstice sunset compared to the alignment of the serpent head pointer. (The vertical scale is for graphical clarity only.) Note that a 1.2 degree “error” in the alignment would be hard to reconcile with the astronomical sophistication of the overall project. Instead of attempting to rationalize the error, I have assumed it was not an error and asked instead where the serpent’s head is actually pointing. Answer: about 15 days either side of summer solstice. What I found was that the serpent’s head does not mark the summer solstice. It marks out an interval 15 days either side of the solstice, a one-month interval overall. The moon is not necessarily full on the solstice itself, but it would be full at some point in this interval. 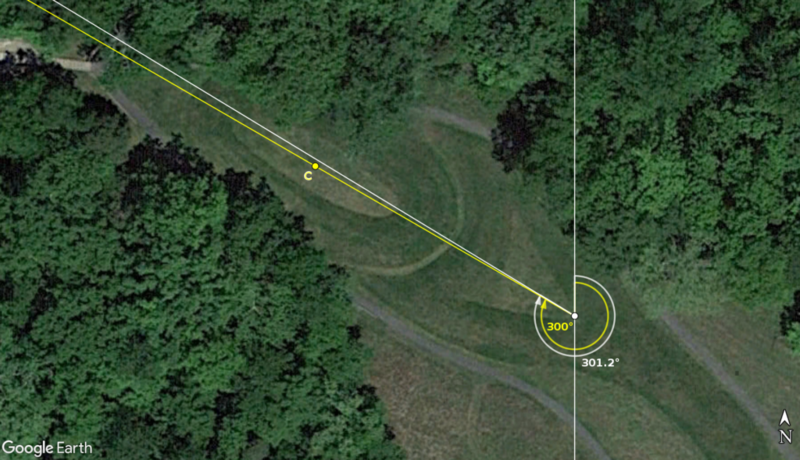 Given the dominantly lunar significance of the Serpent Mound as a whole, we see here not an aberrant single reference to the sun, but rather a mechanism to identify a special full moon: the full moon closest to the summer solstice. This interpretation is significant for the usefulness of Serpent Mound as a pregnancy calculator. The curves of the body are such broad pointers that in some years one might question whether a particular full moon, that is not well centered in the southern loop, is the moon they had been waiting for. The Serpent’s head answers that question definitively. A full moon that occurs when the sunset is north of the serpent head is the summer solstice full moon. At full moon the moon rises simultaneously with sunset, so upon seeing the sun set north of the serpent’s head and turning to see the moon rise in the southern curve, women could be confident that the time for optimal conception had arrived.